This week Brittany challenge is to post the 27th photo from either your 27th folder or your December 2007 folder. I choose the 27th photo from my 27th folder. This was May 19th 2008, I was less than a month away from giving birth to Jack. Michael was working in a retirement community just a few minutes from home so I packed us a lunch and we had a picnic on the grass near the clubhouse. I didn't bring Owen's portable highchair so he wasn't really interested in eating since he had free reign of the place. Of course he wasn't going to go hungry so he did make a mess of himself eating a Girl Scout Thin Mint cookie. On Thursday after Michael went to work I decided to take the boys outside. It felt like we'd been cooped up in the house for too long so we needed a change of scenery. I brought out Owen's town rug that he drives his cars on so Jack wouldn't have to sit directly on the grass. He was so interested in what Owen was doing, but he was content to watch from afar. After all he'd have to touch grass to get over there! Owen had a great time stomping on a mole hole and that eventually led to picking up handfuls of dirt and throwing them. He decided he needed the whole camera instead! Michael got home early from work last Wednesday so we decided to head out to the mall and have some fun! This is the first time we put Jack in the double stroller like a big boy. Normally he's just strapped into his car seat and then strapped into the stroller. This time he got to sit facing out just like Owen. Have I told you I love my double stroller! My mom and dad bought it for us and it's the best piece of baby equipment ever! First off it can fit any kind of car seat and then when the baby is big enough to ride big boy style the seats can be changed all around. Owen and Jack can be facing out like they are in the picture below or Jack could be turned around to face Michael or they could both be turned around...or only Owen could be turned around so he could be facing Jack. It's awesome! After eating a couple pretzels from Aunie Anne's we took the boys over to play at the big boat. The Common's has a boat and a train, but the train is always crazy so we stick to the less crowded boat. We had to pass the train on the way out and Owen was asking to play on it so next time we'll brave the crowds! This was Jack's first time getting to play and frankly he was a little overwhelmed by the situation. He never really cried, but you could tell his eyes were just taking it all in and it was making him pretty sleepy. In fact he fell asleep in the car on the way home. Last Sunday when we had some sunshine we decided to get outside and take advantage of it. While Michael pulled weeds and Owen played on his slide, I thought I would give Jack another opportunity to "play" in the grass. Jack didn't seem to mind the grass at first, but he was getting mad because of the sun. He didn't want to turn around and have it shining in his face. While I was picking up pine cones around the yard he finally got fed up that he could hear me but couldn't see me so he actually got into the crawling position on the grass...that's progress! Even though it was sunny it was still quite breezy at our house so Jack and I decided to head inside to play and left the big boys outside. This is much better Mama!!! Oh yeah and Jack wanted to give a shout out Ga-Ga for buying him such a cute outfit. Becky - The Ames Family Blog! All the award winners need to do is copy the award picture up above and pass on the award to someone else. Let's pay it forward! If I really want to get things done without the boys tripping me up I let them play in the pantry. Owen has loved it for a long time, but it's a fairly new fascination for Jack. They both love to take the macaroni cheese boxes and scatter them everywhere. Oh and the Top Ramon is a big hit! Of course boxes are always a favorite! I have a question for those of you who have boys or have been around your young nephews or cousins or brothers. Is this a boy thing or what??? Owen is always lining up things. He lines up his cars, he lines up the magnets on the frig, he lines up his Noah's Ark animals too. I remember my nephew doing this with all his dinosaurs when he was little. I'm just wondering why they do this...it's so funny! Come = Comb aka Honey Comb. Owen asks for this all the time, but he doesn't actually like Honey Comb he really wants Captain Crunch. Cake = Pancake. I make blueberry pancakes quite frequently. YUMMY! Geek You = Thank you. Owen will also sign this and he's started saying this without even being asked. I love that he uses his manners. He also signs sorry after he's been in timeout, but he doesn't say the word sorry yet. Keeks = Cheeks. He also pinches them when he says this. Fys = Thighs. He squeezes his thighs when he says this. Bum = Bum. He pats his bum when he says this. Ahpit = Armpit. He loves to hid toys in his armpits and ask where they went even if the toy is too big. He's such a character! Nuna = Tuna. He learned this the last time I made Tuna Casserole. No bite = No bite. He says this to Jack after I've told Jack not to bite me or he'll say it to himself if he's biting his clothes. He knows he's not suppose to do that so he's correcting himself. Beetball = Meatball. I made meatballs for the scrapbook day that I went to at my church and we had lots of leftovers. Owen ate them the first time, but after that he wouldn't. They are those yummy meatballs from Costco. Owen said his first sentence a few days ago. We were in the kitchen and he said...Where my...tea go? He then went running into the living room to find his sippy with tea in it. Owen can now do the actions for a monkey, elephant, crocodile and shark. For the crocodile he claps his hands and says "Chomp chomp" for the shark he puts his hands together on top of his head and says "do do do do" like the music from Jaws. The other day he was bringing his Noah's Ark toy over to me and I asked him, "Is that Noah's Ark"? He set it down and put his hands over his head and said, "do do do do". He thought I said shark, not ark! Too cute! The other day when I was making dinner I used a little to much pepper and I turned my head to sneeze. Unfortunately Owen was right there so he got sneezed on. He just lifted his hands in the air and said, "All wet"! And last but not least Owen is now saying his name if you ask him! He puts the two letters 'O' and 'N' together and says O-N. He over pronounces them and it's so cute. I'm going to try to get a video of him saying it and then I'll post it. He's getting so big I can't believe it. Jack's New Skills In Action! In this video Jack is eating grilled cheese for the first time. He also signs that he wants more and does the whole waving at his lips move. The background noise of growling is brought to you by Owen. Enjoy! Jack has learned so many new things recently. He's self feeding himself and eating more and more normal adult food instead of pureed baby food. He particularly loves bananas, Cheerios and grilled cheese. Some of his other skills include pull himself into a standing position. He can do this on most things, but he can't quite pull himself up to the coffee table yet. He has started to sign 'more' and he loves to point too. He just started waving at his lips and smacking his lips while he's eating. He also LOVES to play with this tongue. It's always moving from side to side. It's so funny! I can always tell if he has something in his mouth that he's not suppose to because his mouth is shut. Jack's mouth is almost never shut even when he's eating...he eats and then opens it right up again for the next bite. Oh yeah and he said Mama the other day for the first time. Here are some cute pictures of Jack around the house these past couple of weeks. This was the first time I bathed Owen and Jack in the regular tub. I normally bath them in the kitchen sink, but I thought this would be fun for a change. It was a little hard since this tub has shower doors and it was made even harder because the shower door kept shutting on me. I ended up solving that problem by sticking one of Owen's socks in the slat for the door. You can see it in the picture below. Right after this picture Owen just dumping his pitcher right on Jack's head. Thankfully Jack didn't get too upset about it. After that I told Owen that he should just dump the water on his head. I love the look on Jack's face. I would give anything to know what he was thinking! On Saturday we headed down to spend the day at Ga-Ga and Pa's house. Michael needed to paint their master bedroom and I needed to clean. I also had plans for a friend to come over and visit while we were there. This wasn't any old friend though...well actually it was an old friend, but you know what I mean. Stephanie is my old best friend from junior high school. We saw each other for the first time since my high school graduation last month when we got together with another old friend we reconnected with on Facebook. Since then we've been chatting almost everyday and it's been such a joy. Stephanie and I basically grew up together and she's the closest thing I have to a sister. We shared so much and we both have no idea why we lost contact. It wasn't like there was a big disagreement or anything like that...it just happened. But now it's like no time has past. We just picked up right where we were. It's just so easy! We had so much fun on Saturday, Steph and her step daughter Kelsey ended up staying for dinner and before we knew it it was 7:15pm and we needed to head home to get the boys to bed. I'm sure we could have talked for a few more hours at least. I'm so happy that we are back in each others lives. We missed too much over that 10 year separation and I don't want to miss anymore. Michael had to work late one of the days last week so I decided to take advantage of the nice weather and take the boys out in the wagon to the little park we have in our neighborhood. The park really isn't all that special, but it was at least nice to get out of the house for a little while. This is exactly what I envisioned using this wagon for when Ga-Ga bought it way back in October 2007 at the Mill Creek Garage Sales. I'm so happy that Jack is big enough to sit up in it now and he doesn't fall over. This was the first time Owen actually played at this park. I've taken him to it many, many times, but he mainly wants to push the wagon instead of play. He went down the slide a bunch of times all by himself. The only thing is the slide is a little wimpy so he has to scoot himself all the way down. Owen wore this hat this time last year when I took him to this very same park. I just love this hat...Thanks Uncle Ryan and Aunt Kim! Jack is doing really well with standing up and holding onto things. He's loves being able to see things from a big boy perspective. Owen is always sticking his head through slates like this and wanting you to kiss him. He does it with the gates at home. It's a fun game we play and mommy and daddy don't mind all the extra kisses. After playing on the toys for a while Owen noticed all the wood chips and thought it would be way more fun to throw them all over the place instead. Owen needs to work on his throw a little though because he lets whatever he's throwing go when his hands are behind his head so his hood had quite a few wood chips in it. While Owen was playing I thought it would be nice to introduce Jack to the grass. As you can see he's not a big fan. He wouldn't even get into the crawling position. He wanted nothing to do with touching it. Stay tuned...I'll be scheduling new posts everyday this week. Please take a moment to pray for MckMama's youngest son - Stellan. He's in the hospital dealing with some very major heart problems. This family has been through many struggles this past year and they continue to lift their circumstances upwards to God and he has faithfully answered! I'll be praying that he'll answer yet again and that the answer is baby Stellan will be healed here on earth. This weeks challenge from 4 Little Men and Girly Twins is to post the first picture in your third folder that has brown in it. This picture was taken on February 16 2007. 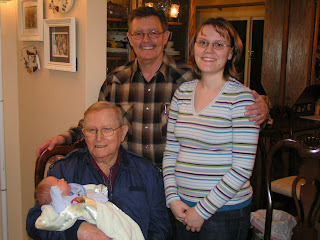 It was Peepaw's 87th birthday. We had gone out to Maria Calendar's for dinner and this was the first of many 4 generation pictures we took before Peepaw passed away in October 2008. Sadly we never got one 4 generation picture with Jack. Check out MckMama's blog and join the fun! 1. I did not get in a mood to completely organize the garage on Saturday night after a 4 hour scrapbooking event at our church. I'm not that organized and driven. 2. I did not spend 3 hours with my best friend from junior high this week. We did not have a terrific time reminiscing about "the good ol' days". We also absolutely did not laugh our heads off looking at old pictures of ourselves in bikinis. 4. 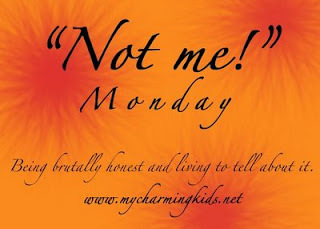 I did not spend a good hour yesterday redo my blog and about pass out when I realized I had lost my blog list. Thankfully I was able to retrieve the information because I am a follower of each of the blogs I read so blogger had that information saved for me already. Phew! today I was in the hospital having a surgery due to a really devastating miscarriage. It almost feels like it's been longer than 3 years because it was only 3 short months after that miscarriage that I got pregnant with Owen. That was a terribly painful time in my life. I had finally gotten pregnant after trying...Clomid for months, 4 rounds of IUI and 2 rounds of IVF. Our baby was conceived in January, but stopped growing shortly after that in February. I ended up carrying that baby until March 13th since the doctor wanted my body to take care of things naturally. That ended up being a really bad mistake because my body didn't want to take care of things naturally hence the surgery I had to have. I ended up losing 43% of my blood and quite a bit of my faith as well. I was terribly upset with God after that and at my wits end. I ended up having to see a therapist just to talk out my feelings. She suggested that we make a memorial of sorts for the baby since we didn't have anything to bury. The only thing I had bought for the baby was a onesie that we used to tell my parents we were going to have a baby. I asked my mom if I could have it back and I made this memorial for the baby. I don't know for sure if the baby was in fact a boy...it was way to early to tell that, but when we had our ultrasound that showed the baby and we found out it wasn't growing anymore, in my heart of hearts I felt like we had lost a son. So we named him Brayden Anthony. It was on our list of boy names just like Owen Michael and Jackson Daniel. It was third on the list because it wasn't either of our favorites like Owen and Jack were, but now I must say I absolutely LOVE that name. That's the name of my baby boy that I won't get to meet on this side of heaven, but who I'm absolutely sure without a shadow of a doubt is worship in presence of our Lord right this moment. Oh how I yearn to hold you Brayden Anthony...my boy!!! Mommy misses you! Jack got his 5th tooth last Thursday. It's to the left of his big front tooth. You can barely see it in this picture. He wasn't being a very photogenic boy for Mommy. Oh yeah and I totally should have kept my mouth shut because now Jack is napping horribly. Today he took 2 half an hour naps and cried a bunch. It just drives mommy to the brink I tell ya. Owen was and is still such a good sleeper that we were spoiled so Jack is just totally frustrating to us sometimes. Oh well! I remember my friend telling me you can't have a good sleeper and a good eater, it's either one or the other. Owen is a great sleeper and not a good eater and Jack is a great eater and not a good sleeper. Head to MckMama's blog to see what other hilarious things people are fessin' up to this week. 1. I did not melt the lid to the cream cheese on the stove. This is not something I do a a pretty regular basis. I am always observant and I definitely see that red light glowing on the stove warning me that the burner is still in fact hot. 2. I did not try to lick Pumpkin out to Jack's hair after lunch on Thursday because I didn't want to get up and get a washcloth. I'm not lazy in the least bit! 3. I did not have to call my mortgage company 3 times this last week trying to straighten out the fact that THEY deposited MY check for February into someone elses account. I did not have to actually send in proof that I paid my mortgage on time and then have to ask them to remove the late charges they had added onto my account for THEIR error. I am not completely furious with them in the least! 4. I did not let my 9 month old try the following foods this last week...french fries, ice cream, 2 different types of chips, bacon and a girl scout cookie. I strictly follow the guidelines that are put in places for infants and their eating habits and I do not turn to mush when Jack looks at me and at my food with an expression that says, "Pleeease mommy!"